The perfect addition to any galactic kitchen! By harnessing the power of the light, make cooking dinner that much more exciting. 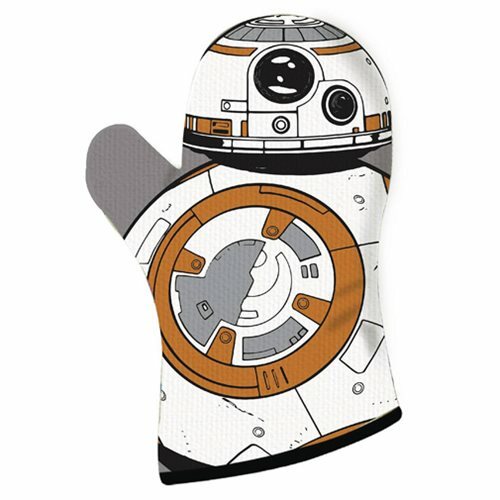 Whether you're turning a well done Tauntaun steak over a bare lightsaber blade, or pulling a dish of blue milk mac and cheese from the oven, this BB-8 Oven Glove will keep your hand safe from the heat. The durable, heat proof, stain resistant fabric of the Star Wars: The Force Awakens BB-8 Fabric Oven Glove is shaped and printed to look just like the droid everyone is looking for. Measures approximately 12-inches long by 6 1/2-inches wide. Ages 13 and up.